There is a reason that La La Land won so many Academy Awards and was a contender for Best Movie. If you want to watch a movie that combines the old with the new, with actors that are reminiscent of a time of bygone years, yet dealing with present time problems, this is the movie for you. If we all love a good movie/musical (and past success dictates we do) then La La Land is a movie that everyone must see. It's a simple, romantic movie, full of song and dance, that sways together in sync with the harmonic melody of the underlying story. There is a reason that this film was the winner of six Academy Awards, including best director, best actress, best cinematography, and best original song. It's fun, enjoyable, and features a great cast. Director Damien Chazelle (Whiplash) has created a movie that transports us back into a time where people were kind, loving, and had hope. It's amazing that where we are actually transported to is a present day with some 1940's and 50's added in to sweeten the setting. The storyline is simple, the effort seems effortless, and the audience comes out sighing at what a wonderful life La La Land really gives us, despite the adversity that is real and relatable. Ryan Gosling (The Notebook) plays Sebastian, a down on his luck, broke musician, who falls in love with Mia (Emma Stone; The Amazing Spiderman 2), a struggling actress/writer. They connect on some level instantly though it takes some time for them to admit it and their romance is played out through song and dance throughout the film. It's not a West Side Story film and there are many times that the song and dance should have been replaced with simple dialogue, but the film works to explore the aspects of a growing relationship and the problems that occur when their romance and successes tear at the fabric of their relationship. Despite some obvious flaws in the song and dance routine, Gosling and Stone have a simple chemistry that makes the storyline and music work together. Both Gosling and Stone bring almost an innocence to their characters that enhance their onscreen relationship and make the audience want to root for a happy ending. They draw us in with the elegance they exude and leave us breathless, sad, and wanting more at different times throughout the movie. Gosling and Stone were the perfect choices for the leads and they don't disappoint. With the added benefit of having all of the above bonus features on screen at your home, this Blu-ray is well worth the purchase for this Academy Award winning movie. The extras provide insight into the scope of filming the movie, actors' mindsets, as well as taking a look at Director Chevelle's perspective. The Blu-ray set comes with both a 4K UHD version and a 1080p Blu-ray HD version. The 4K video is presented in 2160p ultra-high definition with a widescreen screen and aspect ratio of 2.55:1. The 4K UHD color scheme is extremely important to this movie because the unique colors used for backgrounds, costumes, and accent pieces need to stand out from the normal type of movies presentation and the vibrancy of the colors comes alive on the 4K Blu-ray and "pop" off the screen at the audience. The HD version is presented in 1080p and while the picture quality is not as clear and concise as the 4K UHD version, it is still an extremely pleasant viewing experience. While audio is always an important part of a movie presentation, it is especially so in a musical, such as La La Land. The fact that English Dolby Atmos was the preferred audio in this movie speaks volumes, since it is the best listening mode on the market to date, in my opinion. The Dolby Atmos is absolute music to your ears and, in this particular movie, that is very apropos. The music is clear and deep, the dialogue has clarity, and there is never a need to adjust the volume during any part of the movie presentation. It all blends beautifully with the video to offer the audience a full viewing experience. 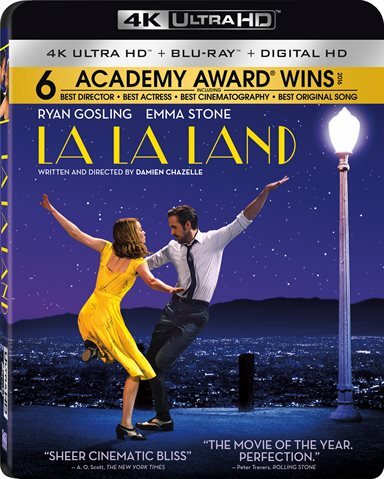 Download La La Land from the iTunes Store in Digial HD. For more information about La La Land visit the FlickDirect Movie Database.